Kandy is a city deep in Sri Lanka’s rainforest hills, yet full of traditions and history. It is where Sri Lanka’s last kings ruled and made this rainforest city the cultural capital of the island. The kings built their palaces and temples, the biggest of them for Buddha’s tooth. They changed a paddy field to a lake that became the new heart of the city and they let traditional Sri Lankan art and culture flourish. We traveled to Sri Lanka’s highlands to see the UNESCO listed Kandy and what did we find? A pleasant city, small enough to stroll through. White temples, magic lake views, traditional dancing and British colonial charm – all mixed together in a living Sri Lankan city. This is central Kandy and Kandy Lake. Kandy’s most important sight Sri Dalada Maligawa, the Temple of the Tooth is marked on the map. Kandy is in the highlands of Central Sri Lanka, surrounded by lush green hills. The ancient city was built in a place that was easy to defend – in a place where the island’s biggest river Mahaweli makes a sharp bend. Zoom out the map to see the river, the surroundings and where in Sri Lanka Kandy is located. Kandy was the last kingdom of Sri Lanka, the preceding kingdoms were Anuradhapura and Polonnaruwa in north. For these two earlier kingdoms check out my post Touring Sri Lanka’s Ancient Cities. 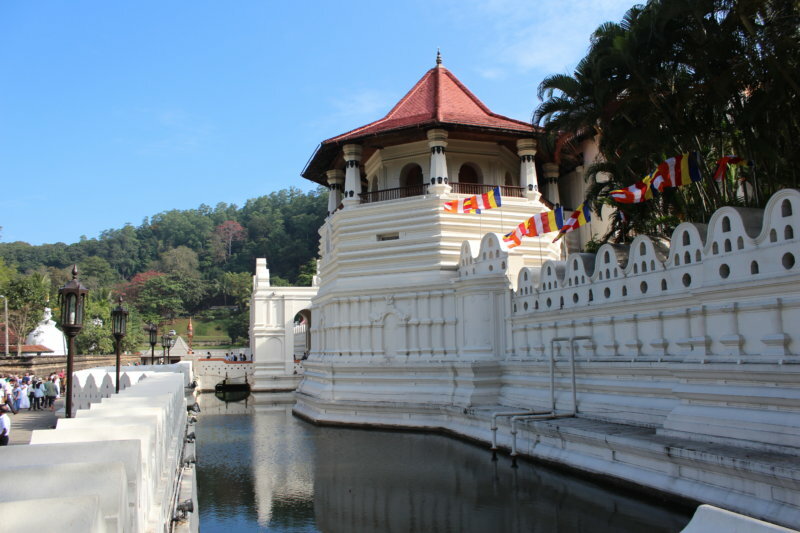 Sri Lanka’s rulers settled in Kandy when Europeans invaded most parts of the island. The first Europeans to come were the Portuguese, then came the Dutch and after them the British. The Europeans ruled the coasts and the kings made the hill country and Kandy their last stronghold. The last Sri Lankan kingdom defended itself until 1815 when the king was captured by the British. Kandy became a colonial city. The British ruled Sri Lanka until 1948 when the country got independent. The capital was moved to the coast but Kandy still holds a position as the center of Sri Lankan culture and heritage. The ancient kings filled the city with their temples and palaces. They were all built in the same style, the Kandyan style. The Royal Palace area with its temples is a real concentration of great historic buildings. Afterwards the British added their colonial architecture. Their most prominent building is the iconic Queen’s Hotel that originally was the Governor’s residence. This is the hotel where the queen used to stay when visiting, as for her birthday in 1954. So modern Kandy is like any other Sri Lankan city with a lot of shopping and entertaining options. People in Kandy live their daily life in the historic city like people in ancient and British colonial times. English is widely used but Sinhala is the main language. And the history repeats itself. Europeans arrive here in great numbers, not to attack city but as tourists. Kandy is a popular tourist city and the Kandyans serve their visitors with what they want. There are more things than Kandy’s great history that differ it from other Sri Lankan cities. The scenery. Kandy has a picture-perfect lake and hilly landscape right in the city. Kandy’s location is stunning. The tropical highlands are full of lush rainforest. Kandy has a cooler climate than most other cities in Sri Lanka which makes living here very pleasant. That’s why the British too wanted to have this region. And Kandy has a beautiful lake right in the center of the city. The lake looks like it always was here. But no, the last Sinhalese king made it in 1807. He wanted to have a lake instead of a paddy field so he built one. A lake needs walls around it not to leak and loose its water, so the king built a decorative stone wall around the lake. And a promenade so he could stroll around the lake. He also built a small island for his pleasure garden and a bathhouse for his wives. He planted trees around the lake and some flowers on the water. The lake was also called the Sea of Milk, Kiri Muhuda. The Sea of Milk is not the only man made lake in Sri Lanka, there are more around the country. Most lakes were made for supplying water to rice fields but this one is just for pleasure. More about artificial lakes in my other posts on Sri Lanka. But why all these lakeside flower stalls and what for are they buying this much flowers? Many locals are buying flowers and then going to the Temple of the Tooth. So let’s see what is happening. It’s early morning of a special ceremony day and a public holiday in the country. Everybody is heading to temples with their offerings and most people are wearing white clothing. Mac, our driver on this trip, says we have to go there too. He is local and knows where we should go at any specific time. So we got up early that morning and had a super early breakfast to get in the temple in time. Today we were going to the Temple of the Tooth! What makes Sri Dalada Maligawa, the Temple of the Tooth, so famous? It is Sri Lanka’s most important Buddhist temple and one of the holiest places for all Buddhists in the entire world. It’s the place where Buddha’s tooth is kept. A legend says whoever has the tooth has the right to rule the island. The tooth was brought to Sri Lanka some 1600 years ago, first to Anuradhapura where the kings lived. After all other kingdoms fell the tooth came to Kandy, the last kingdom. That was in 1592. A temple was built for the tooth in the Royal Palace complex. So today the precious tooth is kept in this white Kandy temple, protected by thick walls and a deep moat. Yet the temple has been attacked at least once. We were gazing at this beauty: beautiful Sri Lankans in their white clothes and the white temple, but our driver said we have to hurry up to get to the main shrine in time. The door to the room where the tooth is kept would be opened which we have to see. All other people wanted to see that too, adults and children. So we left our shoes at the shoe drop and joined the crowd. It was mainly locals but there were tourists as well. Kandy has so many Europeans compared to the east coast we were coming from. But we left the tourist crowds behind. Mac told us which stairs to take to find the best spot to see a bit of the tooth as the door opens. Finally we got in the main shrine, just in time to see the door open. It is the door in the middle. The golden room behind has the tooth in a gold casket that looks like a stupa. We saw it! But we didn’t see the tooth itself, they don’t open the casket at any time. And in addition the stupa contains seven smaller caskets, one inside each other. The temple is a big complex and there is more to see. The ground floor has a chamber with Buddha statues. What we especially liked was the story of the tooth explained in about 20 paintings around the hall. That was very informative and now we know the story. The temple was almost exhausting but there is more to see. The Royal Palace complex has museums like the National Museum, Archaeological Museum, Buddhist Museum – and the Raja Tusker Museum telling about the elephant that carried the tooth. But our driver said we should go and see something else while in Kandy. We should see another Kandy tradition, a dance show. Sri Lanka has three different dance traditions: the low country dance, the Sabaragamuwa dance and the Kandyan dance. Kandyan dance has the strongest traditions and it is the national dance of Sri Lanka. Kandyan Cultural Centre has dance shows at No. 72, Sangaraja Mawatha a short walk south from the Temple of the Tooth. It’s near Kandy Lake. We decided to go and see an evening show which was great fun for a small fee, Rs. 1000. There are five types of Kandyan dance, all handling about Kandyan deities. Fire dance and peacock dance were the most imposing dances we saw. The dancers had colorful costumes and peacock feathers. All dance has drummers beating out rhythms in the background. Kandyan drums are big wooden instruments with animal skin on the sides. After the dance show we saw the lake in a different light. As I am from a lake country myself I know lakes look fantastic all times of the day but this is so different from my lakes. The heat, the crowds, the birdsong, the noise – and the prayer calls. Kandy Lake! It was getting late and we had to leave the rest of the Royal Palace until next time. All those buildings look so great from the outside that I would love to go in and see what treasures they hide. Next time… But maybe you have the chance? In that case, tell me! The historic Kandy really is worth its position on the UNESCO World Heritage list. We were touring the island and stayed in hotels but in Kandy we tried a home stay. When our travel agent suggested staying in a home that made me worried. What will a Sri Lankan home be like, are we sharing the bathroom and do they have water bottles? And when they told us it is by the river I started thinking about mosquitoes. So we went to our home stay, Chaminrich Home Stay 2 km outside the city, in a quiet residential area and on the banks of Mahaweli River. Here you can see what the river looks like. Stunning, magic! We had a jungle river right on our backyard, and a beautiful one! And this is the house. A white, clean home with lots of open space like they have in the tropics. An open breakfast balcony upstairs, and an airy living room downstairs. We were free to use all these spaces but our room was separate. Our homestay room was just like a hotel room, clean, white and airy – and we had a private bathroom! We also had good air conditioning and a balcony to the river. Our host Anusha with his family made us dinner and they made us breakfast, and they gave us liters of clean drinking water. In the tropics you need to drink a lot and hotels normally have too little water in the room. What about mosquitoes? We didn’t see any. Instead there were frogs, a lot of them. We didn’t see any though, they were all down by the river but we could hear them. They made a croaking sound at night which we didn’t hear into your room, only outdoors. That was like jungle music. So we got a small jungle experience in the charming Chaminrich home stay, a place I would return to at any time. From Kandy our trip continued to the tea country, Nuwara Eliya and the South Coast. For more posts on our Sri Lanka road trip and for how to arrange a road trip like this check out my main post What to See in Sri Lanka.